Well, you finally did it, congratulations. You finally pulled the trigger and updated your kitchen with new appliances and granite countertops from A Polished Finish in Atlanta. But your job here isn’t quite complete, not yet. You see, while you did a fine job choosing good-looking and high-quality appliances like a range, refrigerator and dishwasher, there are still some pretty important appliances missing. We are talking about the small appliances that make things easier for those who prepare the meals. For example, a stand mixer is a small appliance you need because you can’t expect your spouse to manually stir everything. That’s hard work and hardly efficient. 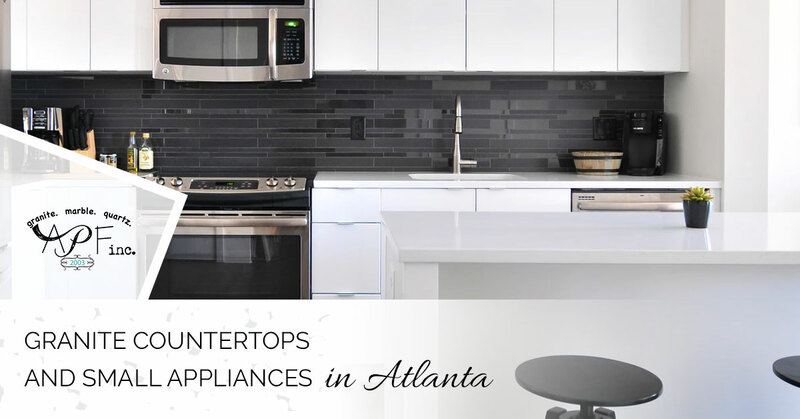 And while the new countertops and dishwasher are greatly appreciated to be sure, the following small appliances are needed to ensure a truly updated and fully-functional kitchen. A blender is essential for mixing custards, pureeing soups, making smoothies and chopping soft ingredients. You can’t expect a chef’s knife to conquer all of the chopping in the kitchen. Be smart and choose a blender with a powerful motor, 500 watts or more should do the trick rather well. Also, pick a blender with a glass jar, the plastic jars are cheap and harder to clean. Make sure you choose a blender big enough to tackle the tasks at hand. If you are serving margaritas to a group of friends, you will want a blender that can handle more than two at a time. Food processors slice, dice, chop, blend, knead, puree, grate and so much more. You can save a ton of time in the kitchen having one of these to help with the food prep tasks. Food processors aren’t cheap, it may very well be the most expensive countertop appliance you will buy. But investing in a quality food processor means your dinner gets to the table sooner than later. A toaster oven might take up a lot of counter space, but it is well worth it. A toaster oven is useful as it can toast thicker bread like homemade bread and large bagels. It is also handy for melting cheese, making mini pizzas and when you want to bake just a few cookies. In fact, there are any numbers of foods you can bake in a toaster oven that makes perfect sense. Turing the big oven on for a mini pizza is a huge waste of energy and will heat up an already hot house. If you were stranded on an island, one with electrical outlets, and could only bring along one small appliance, what would it be? Our choice is easy: A pressure cooker. Modern pressure cookers are super safe to use, you don’t have to worry about exploding chickens. Pressure cookers are also super fast, they can cut cooking time by as much as two-thirds. Which is why they should really be named fast cookers. For example, dried beans need to be soaked overnight and then cooked on a stove for about three or four hours before you can eat them. With a pressure cooker, no soaking is needed and they will cook in less than an hour. And if you are craving fall-off-the-bone ribs, your pressure cooker delivers in under 30 minutes. Have you ever got home from work only to discover you forgot to thaw the chicken you were planning on fixing for dinner? In the past, you would pop in in the microwave and wind up with a rubbery mess. But if you have a pressure cooker, simply toss that frozen poultry in it and in very little time dinner is served. Electric kettles have a lot going for them. They are energy efficient and can heat water a lot faster than a stovetop kettle or microwave. You can even control the temperature of the water on some models. It also shuts off automatically, which is handy. An electric kettle is a deceptively essential countertop appliance, you don’t realize that you need one until you actually have one. If you are a coffee or tea drinker, downing several cups a day, then an electric kettle is a wonderful appliance. If you are interested in having your countertops replaced, give A Polished Finish a call.